Due to the difficulties encountered in wire remittance from West Africa,the Financial Compliance Office of the Funds Release Council has approved that your funds amounting to $12m should be remitted to you from our bank account at the Bank of America,Charlotte,North Carolina. This process will ensure that all encumbrances will be removed from the remittance process.You are required to confirm your receiving bank account information so as to enable the remittance to be undertaken. 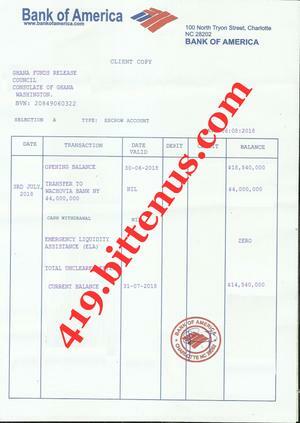 Attached below is the account information indicating the readiness of the funds for release to your bank account.